The AiroGen® PSA LC/MS Nitrogen Generators use Pressure Swing Adsorption (PSA) technology to produce pure nitrogen gas. This technique uses a Carbon Molecular Sieve (CMS) to selectively remove oxygen and other contaminants from atmospheric air. The CMS bed alternates between purification and regeneration modes to ensure continuous nitrogen production. LC-MS analysers do not all share the same requirements in terms of type, flow rate, pressure and purity of the gases needed for their operation; That’s why the PSA LC/MS Nitrogen Generator range from IATT was developed to meet the needs of all LC/MS analyses on the market. 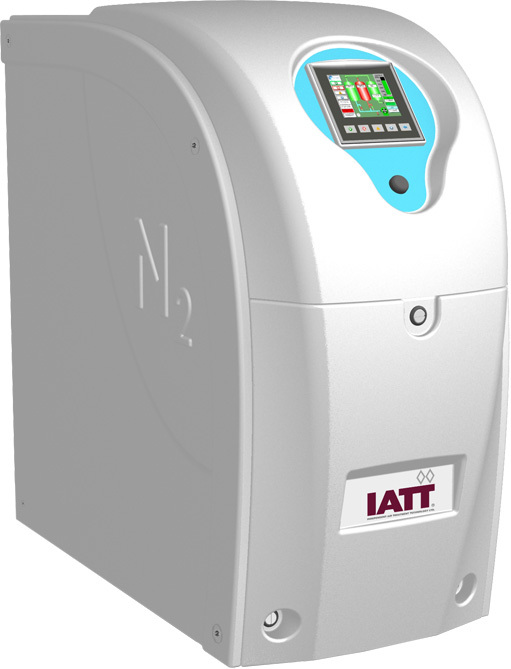 IATT offer 5 types of PSA LC/MS Nitrogen Generators with options for with or without built-in-air compressor. Type 1: With max. output of 35 L/min of N2 gas. Type 2: With max. output of 64 L/min of N2 gas. Type 3: The dual flow, specifically designed for nebulization and collision gas requirements. The generator provides two continuous streams of nitrogen from a single ‘plug & play’ unit. Types 3-4: With max. output of 15 or 25 L/min of N2 gas. Type 5: The triple flow, specifically designed to supply Curtain, Source & Exhaust Gases with dry air and nitrogen for ABI SCIEX LCMS instruments. Fully regenerative PSA technology - reduced risk of gas contamination and is phthalate free. Flow rates suited to LC-MS analyser requirements. Outlet pressures up to 7 barg. HMI touch screen technology to display the process in real time for inlet/outlet pressures. Integral oil free compressor option on most types offers a fully secure N2 supply.